Perfectly Created Chaos! : Favorite Color Combo...at least today. Just a quick post for today's OCC challenge which was to make a card using our favorite color combination. I had a really hard time choosing a favorite combination, there are just so many! I really like Not Quite Navy so I decided to go with a combination using that as a base. I added Turquoise, Gable Green and Apricot to go with it. 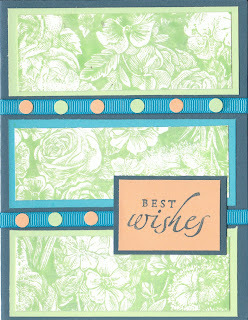 I stamped the floral background stamp on glossy white paper in Gable Green ink and then I cut it in three equal pieces. I didn't want to take away from the flower images, so I decided to stamp the sentiment only instead of adding any more decorative images. After I added the turquiose ribbon, I decided that the card needed to have some more Apricot in it, so I added the circles along the ribbon. I simply used a hole punch and glued the circles the ribbon. Have a great weekend everyone! I will be busy doing things on Monday, so I will be back on Tuesday.Be sure to take some time to see what other people have done with today's challenge. Who knows, you may just find yourself inspired to be creative. I do like these colours! This is a cute color combo! tfs!!! Great card! I do like those colors together! TFS! great color combo..and the BG is beautiful TFS! great color combo!! and the card is great too!! Very pretty card. Great combo! I also loved the GH update!! My, how Michael has grown!! Very pretty card!!! I really like these colors - they look awesome together!! !